Lauren Elizabeth Potter is an American actress, best known for her role as Becky Jackson in the television show Glee. 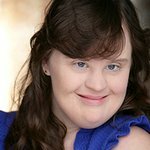 Potter serves as an advocate for those with special needs through organizations including AbilityPath, Best Buddies International, the Down Syndrome Association, the American Association of People with Disabilities, and the Special Olympics. Google trends for "Lauren Potter"
We don't have any videos related to Lauren Potter.